Book a cheap ferry to Hungary online. Find the best deals by comparing ferry companies. As a landlocked country, you may not expect Hungary to feature on AFerry. However, you can use AFerry to book ferries to Hungary from Austria with Mahart Passnave, sailing on the river Danube. Mahart Passnave operates high speed hydrofoil vessels to get from Vienna to Budapest quickly and with unrivalled levels of comfort on board. Booking a ferry to or from Hungary couldn't be easier with AFerry. You can either use the booking form at the top of the page. Or, if you see a price you like on the page, just select the number of passengers and click Get Price. Hungary is a unique country in that, it bears very few similarities to neighbouring countries. Having survived invasions from the Ottomans, Mongols and the Austrians, it has retained it's identity - most notably linguistically. Hungary plays host to numerous UNESCO World Heritage Sites, including the second largest thermal lake in the world, Lake Hévíz. There are over 150 bath houses in Hungary, some of which date back to Roman times. With AFerry you can book ferries directly to Budapest, widely regarded as one of Europe's most beautiful cities. Here you will find fascinating museums, an extensive Medieval Castle District and a youthful nightlife. 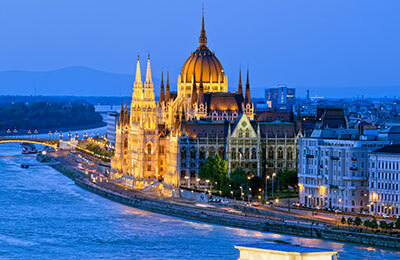 Hungary's world famous lakes, beautiful small villages and truly stunning architecture make it a diverse country to visit, and not one to miss if you are in central Europe. Small in size, Hungary certainly packs a punch when it comes to UNESCO World Heritage Sites, with numerous areas sporting the sought-after status. The second largest thermal lake in the world and the largest lake in central Europe can both be found in Hungary, as well as the largest natural grassland in Europe. 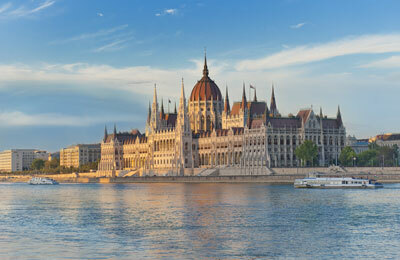 There are many iconic buildings in Hungary, most notably the Hungarian Parliament Building in Budapest. Religious buildings including some of the largest churches, abbeys and synagogues make Hungary a beautiful place to visit if you are interested in architecture and history. Hungarians take pride in their cuisine, which is mainly made up of spicy dishes but they are not "hot" by world standards. The national spice of Hungary is paprika which goes into the national dish which is of course goulash. Meat is popular, particularly pork, beef and venison. Mahart Passnave operates a number of domestic routes in Hungary via the river Danube, including Szentendre, Visegrád and Esztergom. Domestic routes are not currently available to book through AFerry. The highway network in Hungary is fast growing, giving easy access to major Hungarian cities and also the neighbouring countries of Austria and Slovakia. Throughout Budapest, you will find signs for the Metro, an underground rail service. This is one of the best ways for tourists to get around as the main attractions all have underground stations nearby. Budapest is split into two main areas, Buda and Pest. In Buda you can explore cobbled streets and take in the spectacular view of the Danube, and watch Mahart Passnave boats cruise by. In Pest, you will be stunned at the awe of the Hungarian Parliament Building, and learn about Hungarian culture in the Hungarian National Museum. There are over 100 thermal springs in Budapest, the most famous being Gellért Baths which originally opened its doors in 1918. The spa is decorated with original Art Nouveau furnishings, artistic mosaics, stained glass windows and breathtaking sculptures. Hévíz thermal lake is known as "the fountain of life". The healing properties of the lake attract many visitors each year. It's not just the warm, almost massaging feeling of the lake, but the calmness brought by the surrounding trees and flowers. Accompanying spa treatments are also available at Hévíz including mud packs and massages. The Caves of Aggtelek are situated in north-eastern Hungary, near the Slovakian border. There are more than 260 caves, formed over 200 million years ago. They are part of the Aggtelek National Park which also contains the Háromhegyi Pálos church and monastery ruins. The caves earned UNESCO World Heritage site status in 1995.